Happy Halloween! It’s odd, one would think Halloween weekend would be primed for horror releases, but it seems an unusual amount of well regarded documentaries found their way into theaters this past week. Chief among these was Werner Herzog’s INTO THE INFERNO, which found its way into homes around the world via Netflix and also opened at the IFC Center. 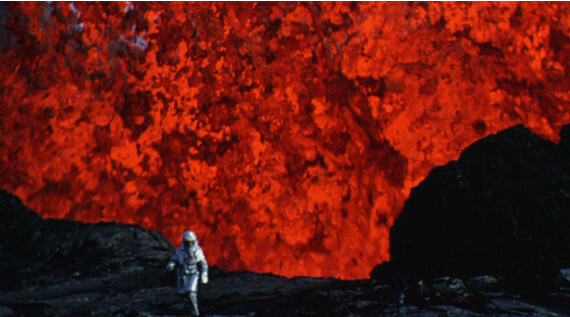 The volcanic film was named WNYC‘s Documentary of the week, was Film Comment‘s Film of the Week, and was selected by Manohla Dargis as a NYT Critics’ Pick. Though I’m fond of the film myself in my review at IONCINEMA, I am in full agreement with Matt Zoller Seitz when he says in his review at RogerEbert.com that many viewers detect that “all the adulation has made him cuddly, and his films warmer, more accessible, and perhaps in some ways more superficial.” We’ll return to theatrical releases a bit later. As we near the start of DOC NYC (less than two week away now), the festival’s Director of Programming, Basil Tsiokos, has been running through a series of previews of each of the festival’s sections over at What (not) To Doc. Tsiokos also looked at the Jihlava International Documentary Festival, the Czech Republic’s widely known nonfiction fest, having ran Tuesday through Sunday, as did Vladan Petkovic for Cineuropa. Cineuropa also had David González on hand to report on the festival’s industry conference happenings in a pair of pieces on documentary making process and funding. Yesterday, the festival announced its award winners, with Maria Kourkouta and Niki Giannari’s SPECTRES ARE HAUNTING EUROPE named as the Best World Documentary, Salomé Jashi’s THE DAZZLING LIGHT OF SUNSET taking the award for Best Central and Eastern European Documentary, and Tomáš Bojar and Rozálie Kohoutová’s FC ROMA named as the Best Czech Documentary. Tomorrow, We conclude our fall season with one final doc by the great Jonathan Demme, his 2007 film about the former U.S. president, JIMMY CARTER MAN FROM PLAINS. For this special screening director Jonathan Demme, Producer Ron Bozman and President Carter’s Literary Publicist Elizabeth Hayes will all be on hand for a post-screening Q&A. Tickets for this closing night screening are available here. As Darah Hansen‘s Realscreen headline reads, the Oscar race is heating up, as the Academy revealed all 145 documentary titles that have qualified for consideration, as well as the 10 films that make up the documentary short subject Oscar shortlist, reports Patrick Hipes of Deadline. But while Deadline broke the news with a simple list of names, Christopher Campbell went deep into the selections, giving background on each and linking to those currently available to be viewed online over at Nonfics. Among the films that made the cut was Kahane Corn’s JOE’S VIOLIN, which was produced by our very own Raphaela Neihausen! And on the topic of Oscars, Bustle’s Sage Young asked, “Will 13TH Win An Oscar?,” while Adam Bhala Lough praised the film in his celebratory piece at The Talkhouse. Ava DuVernay’s 13TH also turned up in Anne Thompson‘s superb IndieWire profile of three female powerhouse doc producers – Lisa Nishimura, Sheila Nevins and Diane Weyermann. A selection of shuffles in the world of publication stirred up some notable news this past week. Tim and Donna Lucas, the publishers of the long running magazine Video Watchdog, announced that they have tragically reached a point where it is no longer financially viable for them to continue to keep the magazine in print. On the flip-side, Gilbert Cruz of The New York Times revealed a “a new website designed to help you make decisions about what you should watch next,” titled Watching. Geoff Todd of One Perfect Shot announced that the blog has been acquired by Film School Rejects, the sister site of Nonfics. To celebrate the news, Christopher Campbell posted a piece titled 25 Perfect Shots in Documentary. Swinging back around to theatrical releases, Jim Jarmusch’s loving Stooges doc GIMME DANGER made a substantial impact, gleaning a NYT Critics’ Pick title via Stephen Holden, as well as warm reviews from Mark Olsen in the Los Angeles Times, Nikola Grozdanovic of The Playlist, and Glenn Kenny of RogerEbert.com. Kenny also covered the single-night showing of Mat Whitecross’s OASIS: SUPERSONIC, this time for The New York Times, as did Brian Tallerico of RogerEbert.com. In its second week of release, Gianfranco Rosi’s FIRE AT SEA popped up in the Los Angeles Times thanks to a positive piece by Kenneth Turan, while the director himself appeared in a trio of interviews with Yonca Talu in Film Comment, with Anna Tatarska at Fandor’s Keyframe, and our own Thom Powers in the latest episode of Pure Nonfiction. Other films that appeared in print this week were RATS via Don R. Lewis of Hammer to Nail, YOU’VE BEEN TRUMPED TOO via David Ehrlich of IndieWire, CITIZEN JANE thanks to Danial Maurer at Bedford + Bowery and HOOLIGAN SPARROW via Joanna Chiu at Quartz. Rosie Stapel’s PORTRAIT OF A GARDEN and Nancy Buirski’s BY SIDNEY LUMET also gleaned a pair of reviews a piece from David Walber of Nonfics and Stephen Holden in The New York Times, and Manohla Dargis, also of The Times, and Brian Tallerico of RogerEbert.com, respectively. If you happen to be looking for docs to watch and you’ve already hit up Christopher Campbell’s links to the Oscar shorts shortlisters, you might want to watch Alex Horwitz’s HAMILTON’S AMERICA,which is currently available to stream via PBS, or Josh Begley’s formally wild BEST OF LUCK WITH THE WALL, which was published by Field of Vision this past week. Additionally, Fisher Stevens’ Leo DiCaprio starred climate change doc BEFORE THE FLOOD can be viewed in full on YouTube thanks to National Geographic. I’m signing off this week with Heather McIntosh‘s new piece at the POV Blog on the many stories documentary archives tell, and what is certainly the article of the week, Jonathan Lethem‘s extensive, funny and insightful profile of Adam Curtis in The New York Times Magazine, appropriately titled, “It All Connects: Adam Curtis and the History of Everything.” As always, if you have any tips or recommendations for the Memo, please contact me via email here, or on Twitter, @Rectangular_Eye.